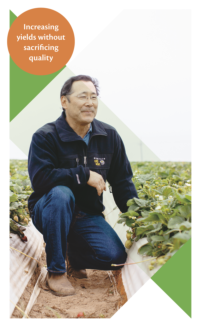 The people of the UC Division of Agriculture and Natural Resources work with California farmers to produce food for the world healthfully and sustainably. Read their stories. UC ANR continually seeks ways to help growers and ranchers improve yields and long-term fiscal viability through innovation. Coffee break: California growers seeking to expand their growing options now can consider production and marketing of coffee, a crop previously not regarded as commercially viable in California. With ongoing advice from a UC ANR Small Farms and Specialty Crops farm advisor, a grower in Goleta has been growing 15 distinct coffee varieties without consuming additional water, by interplanting the coffee with avocado trees. Coffee from California farms has been successfully produced, processed and commercially marketed over five successive seasons. Leading with lima beans: Supported by UC ANR research to develop improved, pest-resistant varieties of lima beans, California growers now lead the nation in production of dry lima beans. Much of the $30 million crop is exported to Japan, and UC research has enhanced lima bean production worldwide. Lima beans fix nitrogen, improve soil health, use relatively few pesticides, and help control weeds in field crop rotations with crops that include wheat, corn, tomatoes, alfalfa and sunflowers. University of California Agriculture and Natural Resources (UC ANR) is a division of the University with scientists based on three UC campuses and in UC Cooperative Extension offices serving all California counties. UC ANR conducts research and shares research-based information with the public about agricultural production, environmental stewardship, water policy, youth development and nutrition. UC ANR offers 4-H to youth in California, nutrition education to low-income children and families, and scientific support that helps farmers address challenges and maintain economic viability.